The sun was shining and the Astra was a-buzz with excitement as we waited for our bus to arrive early on Tuesday morning. Although the bus was stuck in traffic and turned up a bit late, we were still underway before 9am, and hoping to beat the traffic to the highway. It was a nice and relaxing journey down - we each had plenty of space to stretch out on the bus, and some of us even fell asleep for a while! Unfortunately for me, this time there was photographic evidence! When we weren't sleeping, we were singing along to the radio and marvelling at Ann's ability to pick the band out whatever the song! When we got closer to Berry, we were treated to sights of rolling hills, small country towns and sheep grazing contentedly by the side of the road. We arrived in Berry in time for an early lunch. Some of us went to the local pub for seafood, salads and chips, and others went to Thai restaurant to satisfy their cravings for good Asian cuisine. After lunch, we broke off into groups and went for a stroll. Most of us wandered in and out of the little artisan shops and had a lovely time browsing the local crafts and gift shops. Several of us treated ourselves to a yummy gelato or frozen dessert as it was such a beautiful sunny day. There were also some nice parks and places to sit and take in the scenery. At 2pm we trouped back to the bus and got ready to head back to Sydney. There was much swapping of stories and showing of purchases as we travelled back...and perhaps a few more sleeping beauties! By the time we got back to the Astra we were all tired but definitely happy with our successful day out. Everyone had fun and felt refreshed from breathing in the country air and spending some time with friends and neighbours. Now we are all looking forward to the next one...ideas on a postcard please! It was a bright sunny day and the sky was a brilliant blue. We all piled into the bus, provided by BBARV, and were quickly whisked away on a journey of discovery. 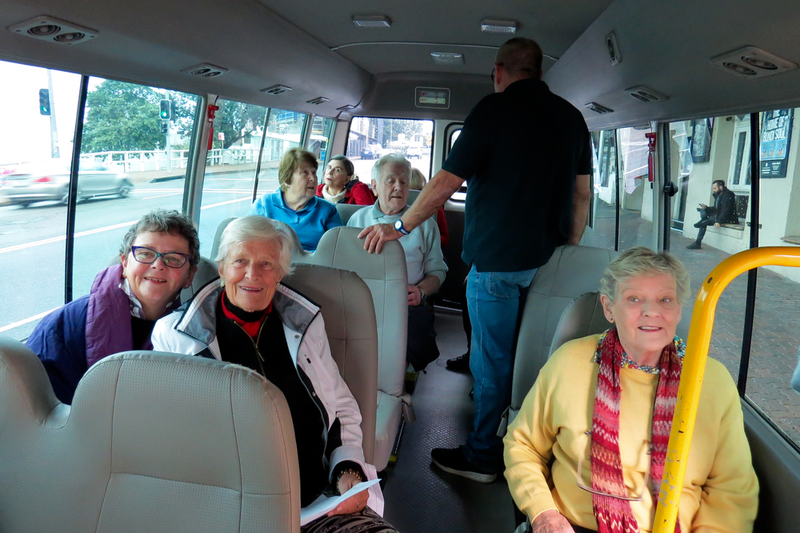 This journey was to take us all the way to North Richmond to visit a retirement village called Riverside Gardens. The name comes from the village's location near to the meandering Hawkesbury River. The residents of Riverside Gardens were very welcoming and put on a lovely morning tea for us. We traded stories and asked many questions about how their village operates. The discussion on the differences between our respective villages was fascinating, and I'm sure encouraged everyone to think about things in a new light. After morning tea had been cleaned up, we were taken on a guided tour of the village. We were impressed with how spacious and new it all was (though what can you expect of a village still in the process of being built with lots of land to spread out into?). After the tour had built up an appetite, we decided upon lunch. 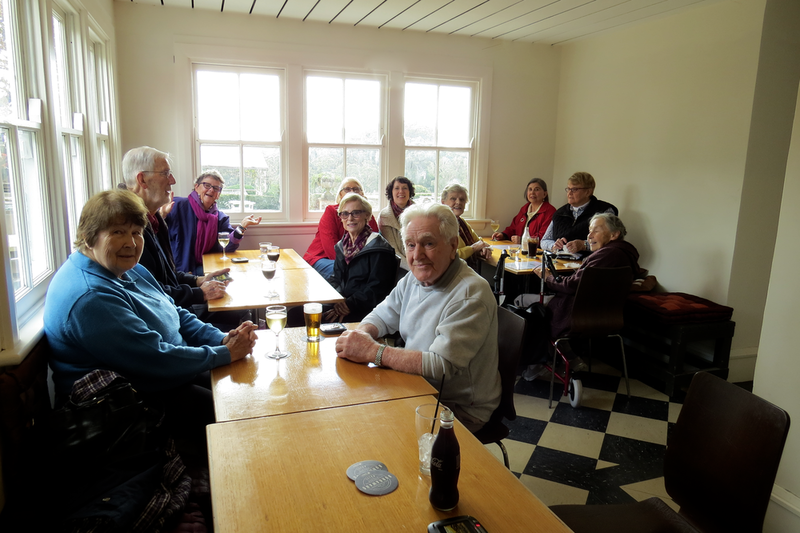 We had planned to go to the North Richmond Panthers Club across the road, but their kitchen renovation was behind schedule and they couldn’t accommodate us. So we jumped back on the bus and headed into Richmond for some lunch. Having been fed and watered again, it was time to make the journey home. We compared notes of our experience at Riverside Gardens. One thing we did agree upon is that it was all so different to Bondi. There was no high-rise, no traffic and the country air was fresh – There’s no place like home! 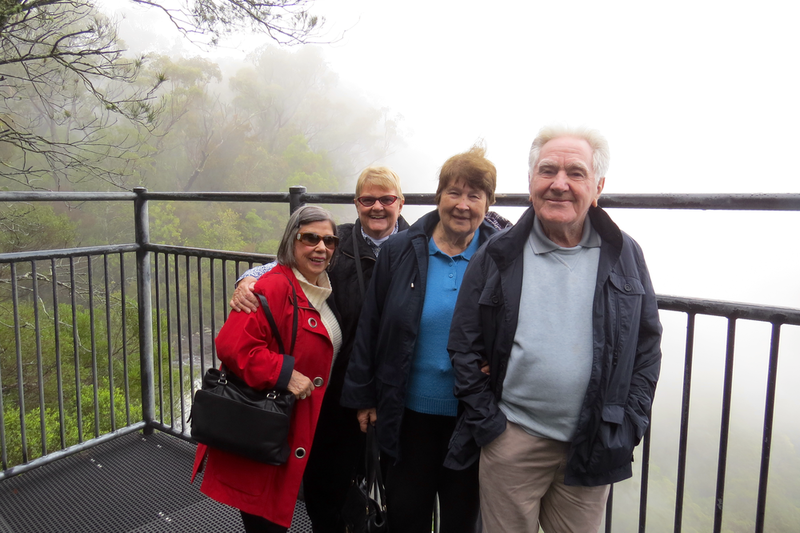 Great fun was had by all on our day out to Fitzroy Falls on 6th June. Our numbers may have been a little smaller than usual, but we more than made up for it in noise and good spirits…just ask Mark our driver! The outlook for the weather in Sydney wasn't fantastic, but the further south we drove the better it became. Despite the forecast, we had mostly sunny weather (albeit with a misty view once we got to the falls). 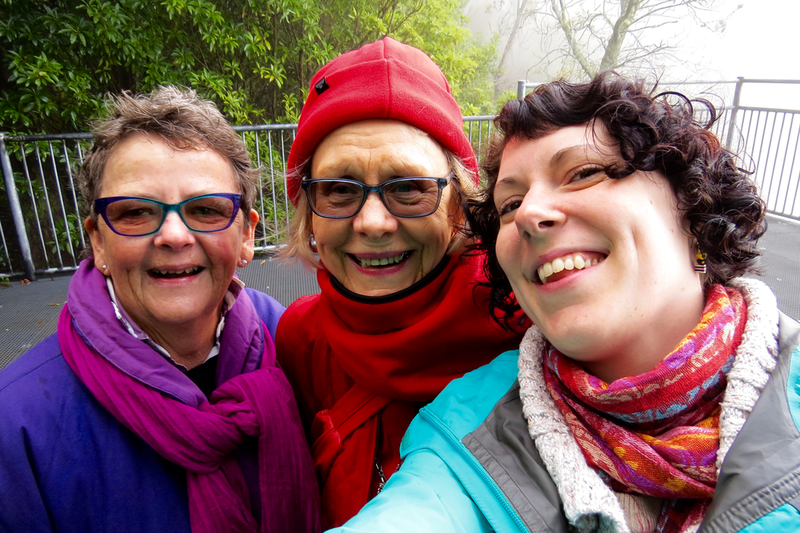 After a short stop at Mittagong Maccas for a coffee, we arrived at Fitzroy Falls and strolled up the boardwalk to look at the falls. Due to recent rain, there was a spectacular amount of water flowing down into the depths. Standing at the top of this 81m high waterfall, this was not a view for the vertigo-prone! Having had our fill of the wonderful bush-fresh air, waterfall lookouts and retail therapy in the gift shop, we went for a lovely pub lunch. The Burrawong Hotel is a beautiful bistro-pub with an open fire and sweeping views out over the local countryside. We managed to get a quiet corner area with big windows and lots of space to spread out and enjoy our food. The food was excellent, the bar well-stocked, and the company superb. In my first role as official ‘Trip Photographer’ I insisted on taking group shots at every available opportunity!